Nothing is more exciting than renovating your home because nothing else gives you as much opportunity to make a space truly your own, especially for truly private spaces like your bedroom or bathroom. These can be substantial investments, but they are investments in your daily comfort and care. It’s important to review all of your options before jumping in, because there’s a lot to consider. When renovating your bathroom, review all of your options for each major fixture. As you plan your upgrade, it’s important to understand how your choice of sinks affects the project. That’s where this ultimate sink buying guide comes in handy. Keep reading for ideas that will aid you as you plan your new bathroom. There are four primary types of bathroom sinks, and luckily they are fairly easy to distinguish from one another because their names are mostly self-explanatory. Wall Mounted: Mounting your sink to the wall saves space and proves especially useful in bathrooms that can’t spare room for a fully vanity, as wall mounted sinks can be attached to the wall without too much additional hardware. Small bathroom sinks are often wall-mounted for extra space optimization. Vessel or Above Counter: Above counter sinks, also known as vessel sinks, sit on top of the entire countertop, like a giant bowl with plumbing underneath. These bathroom vanity sinks sometimes come with dedicated vanities as well, providing a one-piece design. Undermount: These sinks fit under the countertop, making it look like the counter itself seamlessly falls into the sink without a rim. In reality, the rim is hidden because it is mounted to the bottom of the counter. Drop-in: These are a common and easy to install type of bathroom sink, because they are designed to literally drop into the vanity. They are sealed in place to prevent issues (such as leaking) down the road, and they tend to have a lip around the sink that sits above the counter. 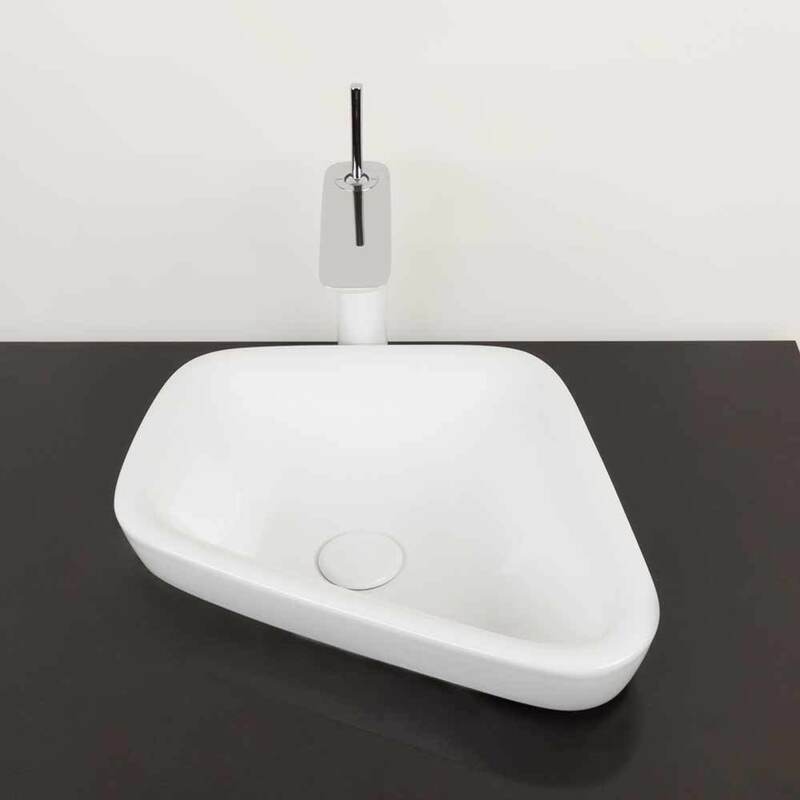 Innovative designs have streamlined the installation process for a number of new sinks. Let’s take a look at a few of Ronbow’s offerings that demonstrate the best features for each type of sink. These sinks were originally designed as efficient, space-saving options for anyone who needed to place a sink without worrying about coordinating and installing an entire vanity set. 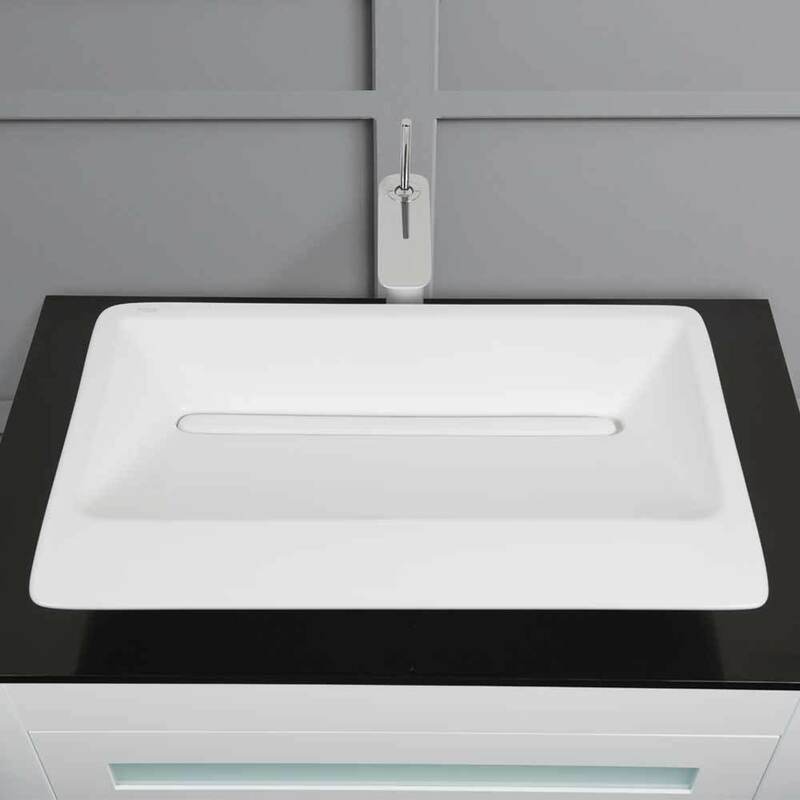 If you are looking for a standalone sink option, wall mounted sinks represent some of your best choices. Wall mounted sinks come in a variety of colors and designs, but what they all have in common is their defining feature: they are anchored to your bathroom wall for ease of installation. Early versions of these bathroom sinks tended to be utilitarian, but in recent years, there has been a push to create brilliant, practical wall mounted sinks that fit into designer bathroom plans. In some cases, it is because the lines of the sink and the no-nonsense minimalism offered by a freestanding wall mounted sink create the exact aesthetic that a homeowner or designer desires. Above counter sinks or vessel sinks are not a new concept, but they didn’t come into vogue until the mid-late 2000s, meaning they have only featured strongly in new bathroom designs for the last decade or so. The trend started because above counter sinks are easy ways to make a bathroom look unique without having to worry about completely redoing the plumbing. In most cases however, they do require a new vanity or at least a new countertop. That’s because vessel sinks need a full countertop to rest on, so vanities and countertops that are designed for drop-in or undermount sinks simply will not work as the sink cutout hole will be too large. The good news is that above counter sinks come in a wide variety of designs and styles, so finding one that has exactly the right combination of features and visual appeal is fairly easy. This sink style works especially well in large bathrooms, because the countertop space taken up by the sink will not be an issue if the countertop itself is already large, providing ample space for your bathroom toiletries. It also provides the opportunity to place a copper bathroom sink or another vibrant sink design as a centerpiece, calling attention to the fixture and vessel sink pairing. If you are choosing an undermount sink, make sure that it will create the visual appeal you are looking for, because the sink will be almost totally hidden. A hidden sink not only provides you with maximum counter space around the sink when you need it, however, but it also keeps all of your sink hardware out of sight, creating an orderly aesthetic instead of a visually cluttered web of pipes and fixtures that many crowded and under-designed bathrooms inadvertently become. Undermount choices come in a variety of sizes and shapes, so it is easy to make sure the actual bowl of the sink fits with the rest of your design scheme, too. Just take a quick look through the catalog to find some examples like the one below. One key factor to keep in mind should you decide you want to include undermount bathroom sinks in your renovation, is the space you will lose under the countertop. The undermount sink will take up a significant amount of space inside the vanity cabinet itself, and that might require you to plan a secondary storage location for the bathroom. Luckily, there are a variety of wall-mounted cabinets, carts, and other storage options that can be made to fit practically any space. These are perhaps the most common type of bathroom sink today, and a large part of the reason for that is their use in large-scale housing communities like apartments and tract housing developments. 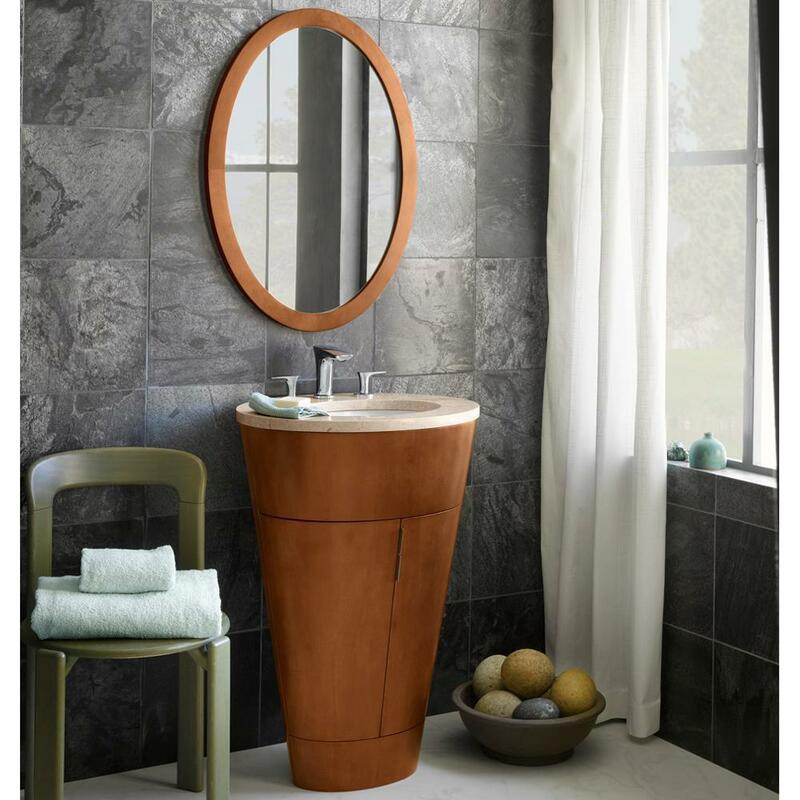 They are also very popular in bathroom vanity and sink combo sets. They are often selected by builders because they are relatively fast to install and very easy to place correctly, since they are nested into the top of the vanity and simply have to be sealed in place. Traditional designs for these sinks are quite basic and functional, but the Ronbow catalog also includes a good selection of drop-in sinks that demonstrate how this particular style can be adapted by designers looking to create a unique visual while also providing a high quality, long-lasting sink you can count on for years to come. When it comes to these bathroom sinks, there is more variety than you could possibly need. 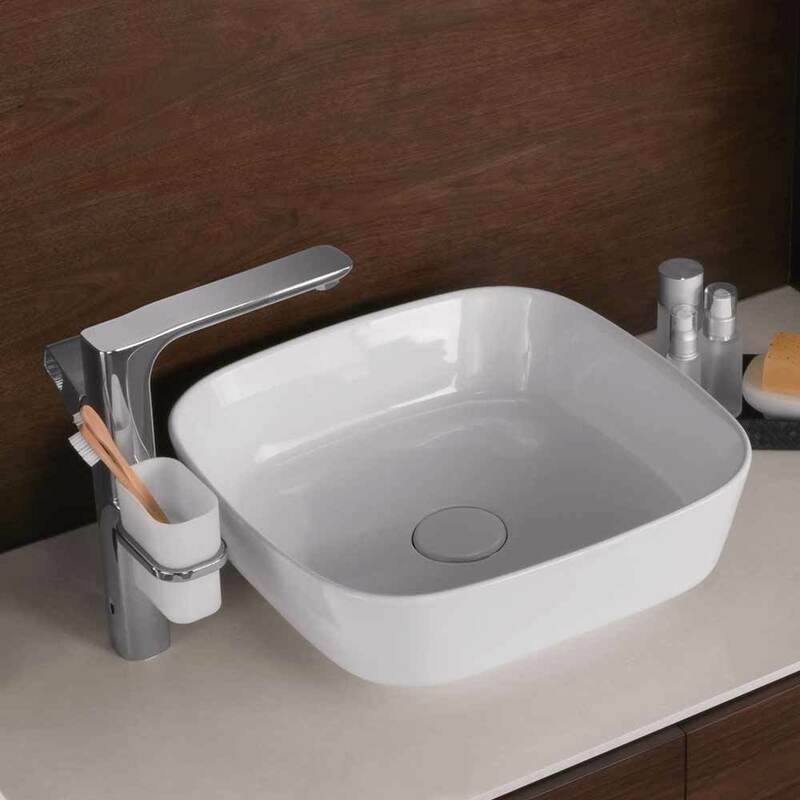 In the first example, you see a rectangular design that incorporates a trough-style drain for efficiency, demonstrating how the choice to include a sink with a lip can create a clean, seamless look. In the second example, the lip is raised further and the design mimics the unique shape often found in above counter sinks, creating an illusory vessel sink style while retaining drop-in sink functionality. The result is a distinctive sink design that straddles two styles while still sitting at a comfortable height. If you are renovating your bathroom, finding the right sink style can be difficult simply because there are so many different shapes and styles available, even after you select the particular mounting style you want. 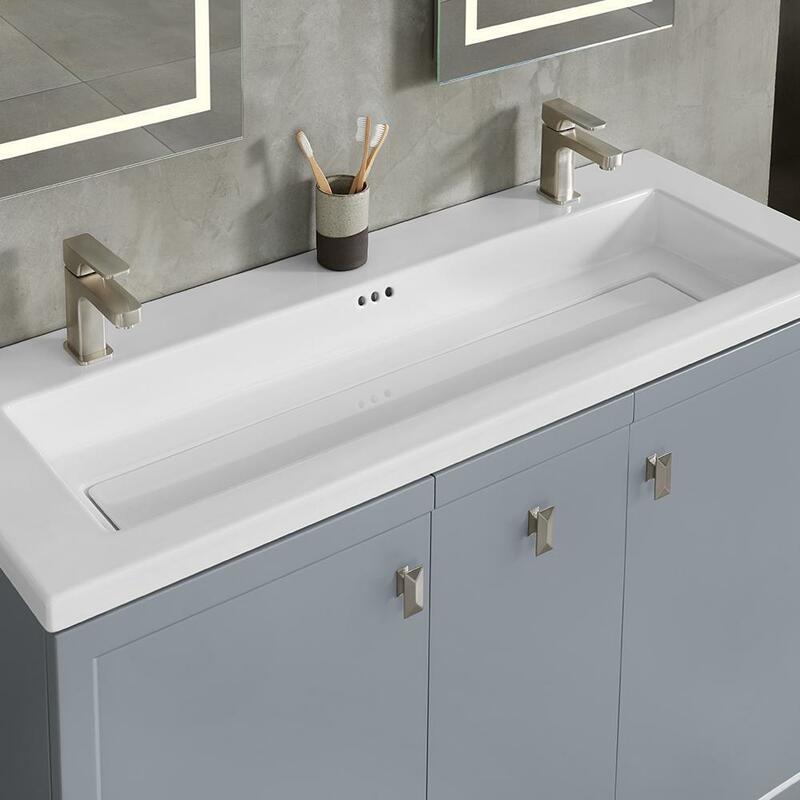 When deciding, the key is to look at all options and what they bring to you—and whether you are buying a vanity separate, leaving one out, or buying bathroom vanities with sink options combined in a set. Consider whether or not you are looking for a vanity, what size and shape you want the sink to be, and how much countertop space you need. If you have some close contenders across styles, considerations like cost or the overall visual unity provided by a bathroom vanity and sink set should be made. After all, the most beautiful and artistically designed bathroom sink in the world won’t help you if it is presented in a way that doesn’t create harmony with the rest of your bathroom. Keep that in mind as you make your selection. For assistance in building your perfect bathroom, contact the professionals at Ronbow today.